The founder of the Committee for the Washington Market Historic District discusses the process of rallying local residents through education and outreach to preserve the Washington Market neighborhood, which is now known as Tribeca. In this interview, architect Hal Bromm discusses his involvement in the preservation of Manhattan’s Tribeca neighborhood. Bromm moved into a loft in Tribeca in the 1970s, when it was in transition from a commercial district into a neighborhood of artists’ lofts. Noticing that insensitive residential conversions were damaging the historic building stock in the area, Bromm and several neighbors formed a committee in 1984 to push for a historic district, an effort which led to the designation of four separate districts in Tribeca by the New York City Landmarks Preservation Commission in 1992. To help educate his neighbors and the public about the neighborhood’s architectural history as designation was being debated, Bromm worked with Oliver Allen and others to prepare a book, The Texture of Tribeca. Later, Bromm served as president of the Historic Districts Council. Q: Okay, are you originally from New York City? Bromm: Born in New Jersey. Q: Born in New Jersey. How did you first get involved in historic preservation around Tribeca? Bromm: After I graduated from Pratt [Institute], I worked for a major New York architectural firm. When I got tired of commuting I found a loft in what was to become known as Tribeca. At a building on Beach Street, 10 Beach Street. After I was in Tribeca for a few years, I became aware of the fact that developers were coming in to work on conversions of loft buildings to residential. Some of them were doing work that was very sensitive to the historic fabric, and others were basically unaware that there was historic fabric and were simply bastardizing the buildings. So in 1984, this was a developing awareness, of course, over time. My Beach Street days were back in the early ‘70s and the Tribeca development really didn’t get very active until the late 70’s. But by the early ‘80s, a few of us down there were noticing that this was going on. So in 1983, we started to put together a local grassroots group and in 1984, it was officially named the Committee for the Washington Market Historic District. David Dunlap, who at that time was a writer for the New York Times on the City Hall Desk and also did a column called “Day by Day,” wrote up a little piece about the formation of our group. He was intrigued by what we were up to. Q: Okay, so now what was Tribeca called at that point when you first moved in in the ‘70s? 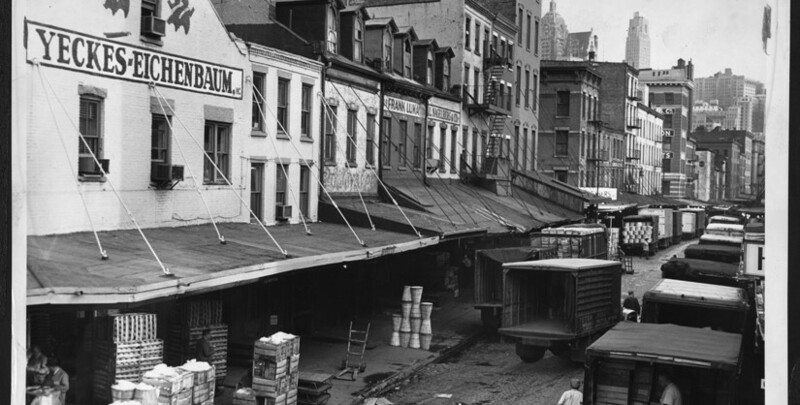 Bromm: It was called the Washington Market. Q: It was just the Washington Market? Bromm: Yes. Which was New York’s food market. Bromm: That name carried on for a while because nobody had any other name for it. The market was—a big swath of the market was demolished in the late ‘60s, and some of that was still going on in the early ‘70s when I got there. Q: So what were the people like in the ‘70s and ‘80s? Bromm: Loft pioneers, homesteaders, people who were involved with arts and design, musicians. Beach Street had Kurt Munkacsi, who was Philip Glass’s sound engineer. He was my neighbor, sculptures, painters. Robert Wilson was there for a while. On other—there weren’t that many people down there, but most of us were involved with art or design or creative fields. Q: What qualities about Tribeca, architecturally or based on your own personal memories, made you feel so passionately to get involved? Q: About the neighborhood, about the architecture? Bromm: Well, it was hard to live in a former cheese warehouse and be part of its transformation into artist studios and live-work spaces without becoming aware of the terrifically rich market architecture that was there in the neighborhood that survived the urban renewal demo. There were cast iron buildings, there were brick buildings, there were stone buildings and everything in between. The variety of architecture was astonishing. As someone who’s always been involved with an appreciation of art and design—it’s just something I’ve always had in my blood—it was hard not to be concerned when you saw people doing the wrong thing. I mean, there were people who did great things and buildings were converted very sympathetically. But then you would see somebody do it the wrong way and say, “That’s awful, surely we can help that person learn to do this the right way, help them find a good architect.” That, of course, led to the idea that the only way we could really protect the resources was to create a historic district. Q: What challenges did you face in trying to do this? Bromm: Mostly education. People who were old timers in the neighborhood didn’t understand that their building, which they thought of as an old funky, dusty, you know, kind of thing that had long since outlived its purpose. In some ways they were right, it had. I mean, the [Washington] Market had moved on, and there weren’t many food businesses left. A lot of the warehouse buildings that were there weren’t occupied by people who were using them for the purpose that they had been designed and built. But it turned out that they adapted beautifully to residences. It took a lot of education to convince the old timers that a) they had a valuable commodity with that piece of land or that building or that structure and b) that its future in terms of high value, maximum value wasn’t necessarily to demolish it and put up a new building. That they might do very well economically by converting it or selling it to someone who would convert it. Q: Okay. So who did you find as a constituency that was going with you on this. in order to educate the others. The other artists, or? Bromm: Yes, we were all pretty much in the same boat. I was probably one of the drum-beating leaders of this effort. Maybe I cared enough to make that effort and get other people to be aware of it, but it wasn’t difficult to get people to sign on to this concern because the people who were in the community at that time all shared what I would call a kind of homesteading instinct. Whether they had bought a space, bought a building or were simply tenants, they all felt very much as participants in the development and growth of the neighborhood. I think it was hurtful to them to see what they thought of as their neighborhood being jeopardized or bastardized by inappropriate development. There was definitely a very proprietary sense that we all shared about the community. Because it was a small community, and in the early days there was not even a name to it. You know, it was our neighborhood. Q: When you were making the case did you, was zoning an issue or boundaries? Bromm: The zoning was sympathetic to leaving things the way they were. It was an M zone [manufacturing zone] and the zoning was M15. So the FAR [floor area ratio] was five and most of the buildings that existed were close to being built out under that zoning. We didn’t have the immediate threat of a neighborhood where people could demolish a building and put up a fifty-story tower. In terms of boundaries, we got a hold of Andrew Dolkart, who I met through citywide preservation people. Andrew worked with us to create boundaries for the district. Q: Now did you fight the four little districts, or? Bromm: Well, we did not fight the four little districts. We realized that while we could have fought the districts and said we want one big district, there was the chance that the whole effort would be pushed aside, that the commission would focus on some other neighborhood and we wouldn’t get anything. This, of course, is completely contrary to what we all know to be the New York City Landmarks [Preservation] Law, and so the Commission then, as it still does now—in fact, some of us think it does it even less effectively now. The Commission has rarely followed the Landmarks Law, which states that the Commission is supposed to identify and protect historic resources through out the city, not pick and choose which neighborhoods they feel like designating based on how loud the neighborhood screams for designation. It would be wonderful to imagine that a hundred years from now, when someone read through notes of this interview, that they said, “Imagine that, the Commission way back then really didn’t do its job.” But I think we always must remind ourselves that that is the case, that they have not and do not do their job under the law. The law is not ambiguous. Q: Because of this, because of them picking these four districts instead of your larger district, did you lose important buildings? Q: Can you tell me about some of the buildings that were lost? Bromm: The building I live in and have my business in was left out of the district. Bromm: 1895, [George E.] Harding and [William T.] Gooch, the building across the street from it was left out, similar period and date. The building—I’m in a corner building. The only one of the four corners of that particular block, which is Chambers and West Broadway, the only one of the four corners that was part of the district was the northeast corner, which is an old hotel that now is relatively intact. The building directly across from my building at the southeast corner was demolished last year. In its place is being constructed a new building. Of course the new building is being constructed outside the purview of the commission, because it’s on a block that they left out of the district. Next door to that was a very famous building in terms of the neighborhood iconography. It used to be a champagne warehouse. There’s a photograph of it in the Texture of Tribeca book as it looked back in the ‘80s. That building suffered a fairly dramatic transformation by having—it’s a five-story building—by having a five-story addition popped on to the top of it. We’ve seen this kind of thing go on all over the neighborhood. On the blocks outside the district, in some cases right across the street from the district. You know, the idea that those of us involved in preservation used to pursue about having buffer zones around districts, even that hasn’t prevailed in Tribeca. Q: How does that change the feel of the neighborhood to have these out of character structures? Bromm: It degrades it. Particularly when they look so inappropriate. It’s—while one could make a case for having brilliant contemporary architecture as infill, where we’ve seen these kind of—what some people call lollipop towers—on top of old buildings, or rooftop additions. Or in the case of the hotel that’s now under construction, a total demolition. Usually the new construction is fairly poor in terms of its architectural quality. Bromm: You know, the neighborhood of Tribeca is now more popular than ever. We all know about that, but even in the early days, the people who were there were very sophisticated people in terms of art and design. It wasn’t as if people were saying everything must be frozen in amber and we don’t want to see any new construction. That wasn’t the case. We all lived in buildings that were transformed through adaptive reuse to residential or live-work spaces. Some of them better than others in terms of the, again, the architectural excellence and the level of sophisticated design. But it’s one of the things that New York suffers from—is an incredible confusion between great architecture and brilliant design versus new construction and shoddy design. I think most members of the public are relatively unaware that there can be good and bad new architecture. Q: Now Tribeca was one of the first areas that had adaptive reuse in the city, right? Bromm: No, SoHo had it. Q: SoHo was the—how do you feel like Williamsburg and all these other places were set the precedent was set by these neighborhoods, SoHo and Tribeca? Bromm: Well what happened in SoHo in some minds, which I think is probably true, is that as artists homesteaded the empty lofts in SoHo—most of them illegally, with the landlords turning a blind eye—they created an interesting new neighborhood that eventually succumbed to the success of tourism and growth, and ended up being slowly but surely priced out of it. A lot of the artists began to migrate south to Tribeca. Some of them went as far at the Wall Street area and others crossed the bridge and went to Dumbo or Williamsburg. Those now are all neighborhoods that have seen their own gentrification. I think you’re hitting on what has been a trend not only in New York but across the country and indeed, around the world. In Paris, there’s a wonderful neighborhood called the [Le] Marais and when I used to visit the Marais in the ‘70s it was absolutely a slum. The architecture was fantastic. I mean brilliant, brilliant squares and blocks and streets and really wonderful, but it was a neighborhood that had been let go because it wasn’t needed. It wasn’t desirable. When artists and architects and design people discovered it and started to bring it back to life, of course it took off. There’s a great parallel between the Marais in Paris and SoHo in New York or Tribeca in many ways. Now it’s one of the most successful brilliant, popular tourist attractions etcetera, etcetera in Paris. I’m not sure if that answers your question or not. Q: Let’s see what else do I have here. So how did the book The Texture of Tribeca, how did that fall into your case and how did it work for you? Bromm: Well, we thought we needed a marketing tool. There was a—there was a feeling that if we could get Andrew [Dolkart] to write about the architecture, we could build an attractive book around that story. The story was that this was one of the oldest parts of Manhattan. A lot of it had been rebuilt to serve the marketing and mercantile needs. There were old department stores down there that survived from when it was a fashionable residential neighborhood. There were of course, all the market buildings that survived from the food market. Andrew said yes. Connie Baldwin, who was a terrific supporter of everything we worked on, very much a part of the team, very good graphic designer. She agreed to donate her time to doing the graphic design of the book. Oliver Allen and I and several others worked on the photographs and we did it, we put it together. Much to our surprise, I mean, we just wanted something attractive that people could say, “Oh, this is Tribeca. This is what you’re talking about.” But much to our delight, the book won an award. Bromm: And it sold very well. It was sold at Rizzoli [Bookstore] and a couple of other outlets. I don’t know how many we have left. Some people have said, “Why don’t you do a reprinting?” I suppose that would be a good idea. Q: People are interested in it. Bromm: Well, let me add about the book—it cost over fifty thousand to do the book, and that was not paying fees for the graphic design, which was pro bono and the photography and so on. To raise money to publish the book, we held an art action. I was the ringleader for that, with my art gallery and business. We got neighborhood artists, including Richard Serra, who lives on Duane Street, and many, many others. I mean, just about everybody who lived in the neighborhood who was asked said, “Yes, of course I’ll give a piece.” We had all this wonderful work, and we sold it at a benefit auction, and we raised enough money to do the book. Q: How many years did the process of making the book from the first idea to actually getting it published? Bromm: I think we got it done in about under two years. I think it was about a year and a half, maybe close to two years. Q: This was how long before the actual designation? Bromm: Oh, the book came out in the ‘80s and we didn’t have any designations until the ‘90s. Q: He’s still obviously connected. Everybody who got the letter said, “Ah, this is terrible, but it’s true. Yes, okay.” That was really what launched the effort. The book in many ways was a continuation of that, as well as a marketing tool. It helped people visualize in, you know, in print form, what the whole thing was about. It was also very helpful to give that book to building owners. I had mentioned that education was a big part of what we had to do, and it was very helpful to give that book to people whose fathers or grandfathers had started the nut and bolt supply company or the cheese importing company or whatever their business was. They would look at the book, and they would read it, and they would start to understand what we were talking about. Of course, as time went by and more people came into the neighborhood, they were also able to see buildings that had been converted and see the new life that resulted from that conversion. Ultimately, we got a lot of people to understand that it wasn’t a bad idea to be in a historic district. On the other hand, we had organizations like the Real Estate Board of New York—REBNY—running around telling building owners that this was a terrible idea. That they were going to lose all the value of their building, they’d never be able to sell it. Some of these people were in their late 60s, early 70s, were thinking about retiring, passing it on to their families, their children. Selling it, giving them money, whatever. Education was a major, major part, and in many ways that hasn’t—from a preservation point of view—that really hasn’t changed. Q: Did you get these strategies from other movements around the city or were they all new? Bromm: We had a lot of really great advice from people like Arlene Simon, Eric Allison, Tony [Anthony C.] Wood, Eric and Everett Ortner, Ann Everett Ortner—Evelyn and Everett Ortner, excuse me. Evelyn, by the way, was a graduate of Pratt [Institute], and she hired me as an assistant to work for her when I was a student at Pratt. Bromm: Yes. That’s how I got to know Evelyn and Everett, and they had just launched their campaign with the Brooklyn Union Gas Cinderella Project to get people to be aware of the value of the brownstones in Park Slope. Bromm: Absolutely we had lots and lots of wonderful people. Halina Rosenthal was fantastic. In fact, Halina came down. We had a little meeting to officially form the group and we invited David Low, Halina Rosenthal, I think Tony Wood was there, maybe Arlene, I can’t remember—and they were all great. We had advice from Kent Barwick, who was a little, perhaps less spread too thin at that point, and was able to be more focused on what we were doing. I remember Kent at one point said to me, “You have to remember that one of the best things to do is to create a forward momentum that becomes unstoppable, like a snowball rolling down a hill. And as it rolls down the hill in the freshly fallen snow, it gets bigger because it’s picking up snow as it roles, and so it gets bigger and goes faster.” That, I thought that was good advice. Of course, that doesn’t help when you get a commission that says, “Oh, here’s four little districts instead of one big one.” Then once we got past that hurdle and said, “Okay, we’re going to bite the bullet and work with the four districts,” then you get to the [New York] City Council and some guy from Staten Island says, “Oh, I think this building on West Broadway should be taken out of the district.” Well, what the heck does he know about Tribeca? It’s not his district. Go figure, politics at work. One of the interesting things, which we’ll touch on in depth if you want to, was that David [F. M.] Todd, who was the commissioner at the time—the chair of the Landmarks Commission at the time, said, “I know you want the district to go further south than Chambers Street, but what were going to do is we’re going to put up for designation fifty-two individual landmarks south of Chambers Street rather than extending the district to include them.” I said, well that’s very dramatic news, but David, these owners are going to go ballistic. They don’t want to own a individual landmark. We’ve barely got them to the point where they can accept being in a district. You know, an individual landmark to them is the Empire State Building or the Chrysler Building, not a little five-story loft building in Tribeca. He said, “I know, I know, but this how we think we should do it.” Again, none of us could figure that out, didn’t make any sense at all. Q: So that’s what ended up happening then? Bromm: They then proceeded to have hearings on all these buildings. We dragged everybody in the community out to testify in favor and whereupon nothing happened. They were heard but not designated, and here we are, how many years later? Many of them have been bastardized or altered inappropriately, still haven’t been designated. We’ve had a couple here and there that have come up, and the commission has said, “Okay, we’re going to designate one building on one block, or maybe we’ll do two.” That’s about as far as it’s got. Do you feel like that still holds true for Tribeca? Bromm: For the most part. But there are places that have started to look like Third Avenue or Second Avenue or somewhere that’s not Tribeca. One of those places is site 5B and 5C. Does that mean anything to you? Bromm: Okay. You recall I mentioned that the Washington Market was largely demolished. There was a swath that ran from roughly North Moore Street all the way down to, let’s say, Park Place between the West Side Highway and Greenwich Street. So it went North Moore to Franklin, Franklin to Harrison, Harrison to Jay, Jay to Duane, Duane to Reade, Reade to Chambers, Chambers to Warren, Warren to Murray, Murray to Park. It’s a fairly big swath, many many blocks. That was cleared as an urban renewal area project and it was called the Washington Street Urban Renewal Area Plan [Project]. Washington Street was the street that was between the West Side Highway and Greenwich parallel to them, it was a north-south street. We had running east to west three blocks. Greenwich—well, two huge blocks which most people would think of as three blocks—Greenwich to Washington, Washington to West Street and then all the blocks I just named running north to south. Part of that land was fairly quickly developed in the form of three high-rise apartment towers that look absolutely like Second or Third Avenue in the 60s—in the east 60s—and that building was called Independence Plaza. It’s been until recently a rental building, and now it’s, was a Mitchell-Lama [Housing Program] deal, that building is now changing. It’s been sold, and it’s changing into a conversion that’s going to be a condo. Yes, “luxury.” There’s nothing luxurious about it. The buildings are pathetically poor design. They regularly—the brick facades regularly are covered in scaffolding because they’re, the pointing’s falling out yet again or something. South of those buildings but north of Chambers was a big opened area, and the community fought the idea of development there and said this should be a park for the community. This is a growing community. It’s going to become more populated, and there’s no open space, there’s no park space. Through that effort the city created, with the community, Washington Market Community Park, which is there today. As soon as you cross Chambers Street, you got to sites that were left vacant until very recently. You’re talking about something that was demolished in the ‘60s. You go all the way through the ‘70s, all the way through the ‘80s, all the way through the ‘90s. Here we are, it’s 2007. One building has just been completed, the other is still under construction on sites 5B and 5C. This Washington Street Urban Renewal Area Plan had all these site numbers. Bromm: It was all condemned. The city took over title to the land and the concept was that they were demolishing all these 19th century, 18th and 19th century buildings in the name of urban renewal to prevent the spread of blight. Yet the city, having demolished all of these structures, which clearly had they left them alone would now be worth millions of dollars and on the tax rolls. Imagine what that would create in terms of tax revenue. You know, more Tribeca lofts, etcetera. A lot of this land has set undeveloped, vacant, not earning a nickel for the city until just now that one of these two buildings has been finished. The community fought tooth and nail against what’s been built there, which are high-rise apartment towers. They don’t have anything to do with Tribeca. They wall off the community from the Hudson River and from Battery Park City across West Street. They’re not well designed, to add insult to injury. It would be one thing if they were world class architecture, but they’re not. They’re just cookie cutter kind of Second or Third Avenue apartment towers. They’re over-scaled and they are a tragic mistake, but there they are. So in answer to your question about is Tribeca still gritty and real and not cute? We have these kind of intrusions, which are very negative, and it’s a shame. They will both cast very ominous shadows over Washington Market Park. There were shadow studies done by the Park Board [Parks Maintenance Corporation]—well, not by the Park Board, but the Park Board demanded it and the Community Board said, “Yes, we have to do this.” They said, “Well, there will be shadows, but they’re not going to be so bad.” The only thing that we did get that was positive out of this all this land that the city demolished the buildings on was the Washington Market Park, and across the street at Chambers and Greenwich is Richard Samton’s [ph] award winning PS 234, which is a threestory high elementary school. The community had to fight for that because the city, in its wisdom, didn’t understand that a community like this needed a school. Q: Right. So in the years since it’s gotten more high-rise and more different types of development, has the people moving in, have the type of person moving in changed? Bromm: We’ve had, I think, a real appeal in Tribeca to families because PS 234 happens to be a great school. It’s now woefully overcrowded, so there’s now a cry to build a new school. Q: Maybe we should build another school? Bromm: The city again grudgingly did build a school in Battery Park City. They hadn’t master planned it. The Community Board back in the early ‘80s said, when Amanda Burden was part of the Battery Park City Authority team—and she’s a smart gal. The Community Board said, “Where are the schools? You’re building all these apartment buildings, you’re moving Stuyvesant High School to the neighborhood, that’s great. Where will the kids at Stuyvesant have a ball field? What about the other schools, what about a middle school, an elementary school?” It wasn’t on the planning boards. So the Battery Park City Authority, late in the game, after years of screaming by the Community Board, said okay. Q: We’ll give you a school. Bromm: We’ll put a school in this building right here. An intermediate school. But to do it, we’ll have to take away residential space. So we’ll have to make the building much taller because we can’t jeopardize the developer’s profit on the building by taking away residential floors for the school. We have to make it taller. We now have buildings in Battery Park City that are much taller than they were originally meant to be because of that kind of stuff. Bromm: Then there was a big open space that hadn’t been developed. The community pleaded for it to be a ball field. Battery Park City Authority said, “Okay, we’ll make a temporary ball field.” Well, as the years went by, the community wasn’t going to let that go. There was a huge fight to keep that ball field, because there, again, was no big open space for kids to play. Battery Park City Authority, which is answerable to no one–I mean it survives governors, mayors, you know, it’s an independent authority. It goes on on its own steam, said, “Okay, we’ll make the ball fields permanent.” But to do that of course all the buildings around would have to become more taller, because we can’t—we’re not going to have all the space that would have been for apartments had we built on the ball fields. You know, this is New York City at work. So what’s the impact of all this on Tribeca? Well, it’s great that Battery Park City and Tribeca got a ball field and we got an intermediate school. What that has done is it has drawn families to Tribeca. It’s still a neighborhood with a lot of creative people, a lot of people who feel I think very relaxed and very comfortable in the neighborhood. I think a lot of that has to do with the fact that where we have preserved the historic character it feels like an old part of town. It doesn’t feel new. Q: Which is unusual, yes. Q: Let’s see. You were a president of the Historic Districts Council [HDC], or are still? Q: You were. How was that experience? Bromm: Very rewarding. Tony Wood and Eric Allison got me to join the board of the Historic Districts Council back in the ‘80s when they saw what we were trying to do in Tribeca. Indeed, HDC was very, very helpful. Franny Eberhart was the part-time person at HDC who then became full-time and who’s still on the board, but at that time she was an employee of HDC. She, under Eric, who was chair at that time—or president at that time—was very, very helpful in terms of the work in Tribeca. Franny did a very interesting study after the first district was put in place. I think the first one we got from the commission was Tribeca West. Franny did a study of Tribeca West in terms of building permits, permits pulled, renovation work, economic activity—that disputed that the notion that once a neighborhood was declared a historic district, economic activity and development diminished. Quite the contrary. It was more than ever, and all of the real estate brokers, of course, couldn’t wait to say “in the historic district.” Because they know that people value—potential owners value owning property in a district because they know they’re protected. That’s not disputable. The sense of place that Tribeca represents in the district designation areas is very palpable. So that became something that was economically a good investment for potential owners. One of the ironies is that we would see developers doing awful stuff outside of the districts that people would ignore because they’d buy the stuff in the district that had been done under the guidelines of the commission, and therefore looked appropriate and was done well. The developers who were doing work outside the district, if they didn’t hire a good preservation architect who knew what he was doing, ended up with a product that was frankly down-market. They wouldn’t be able to sell it as successfully. It didn’t have the brokers’ support, and they would end up making less money. The idea of being in the district became a win, win, win situation. Bromm: Some of them have. Some of them have. Q: Let’s see, what else. Can you tell me about working in preservation with the different mayors that we’ve seen in the past twenty years or so since you’ve been involved? Q: Yes, under different mayors has there been a big change? Bromm: Well, I think with, there has been a big change, certainly. The [Mayor Rudolph] Giuliani era was catastrophic, and under [Mayor Michael R.] Bloomberg, frankly it’s gotten worse. Bromm: None of us would have imagined that in terms of preservation. I think Bloomberg was someone who we all had high hopes for. He certainly said all the right things when he was a candidate. He identified the fact that the commission [Landmarks Preservation Commission] was underfunded and that he would change that. He identified the fact that the commission couldn’t be taken seriously if it only had one enforcement agent for all five boroughs, and he would change that. He said all the right things. Unfortunately, he appointed someone to the commission who absolutely is beholden to him, is not knowledgeable about preservation at all and doesn’t particularly seem interested in it. We’ve also seen people put on the commission who not only are not knowledgeable about preservation or preservation advocates in any way dedicated to upholding the Landmarks [Preservation] Law, but in fact we’ve seen people put on the commission who have lobbied for developers in opposition to basically the Landmarks Law. So it’s gone from bad to worse. That, we surmised, came from the concept of the time that was alive and well in the real estate community that Wall Street was going to be a huge, huge growth area. That Wall Street would gradually spread northward, and that all of these buildings on Warren and Murray and Park Place and so on, that those blocks would be prime areas for rezoning, demolition, up zoning, and that Wall Street Towers could march northward. A total folly. I can’t imagine, you know, none of them were even remotely thinking about how digitization or technology would change trading, trading floors, business practices. You have to wonder what they were thinking. Clearly it wasn’t much. Bromm: Maybe it’s easy to say that in hindsight, but none of us could make any sense out of it at the time. I mean, we heard this over and over. “Oh, they think the southern edge of Tribeca is going to become Wall Street North.” We heard this over and over again. It was an open secret. So I think under Koch, David Todd was held back, and it wasn’t that David didn’t want to do the right thing. Here is where you see a difference between someone like [Robert] Tierney, who we have now, or Jennifer Raab, who was the long running chair under Giuliani, and someone like David Todd or Gene Norman or Laurie Beckelman. Those were people who understood what the Landmarks Law said, I think, and who were prepared to uphold it and to work toward it, and who had commissioners under them who worked with them in concert. When Giuliani came in, that all changed. Jennifer Raab wasn’t particularly interested in upholding the law, even though her background was a lawyer. I mean, her background is law. If you compare someone like David Todd to Robert Tierney, it’s almost farcical. You know, Tierney just doesn’t have a clue. He really doesn’t. I mean, it’s interesting because when Bloomberg was running for Mayor he said, “I know who I want to run the [New York] City Planning Commission.” The person he had in mind was Amanda Burden. Well, Amanda is someone who had a very deep planning background. She was on the Battery Park City Authority Board, and she was involved with the planning with Cooper, Eckstut [Associates] and so on. I think in many ways she’s someone who is very, very thoughtful and tries very hard to do a good job. Obviously she doesn’t always do what we’d like her to do. We have concerns about many areas that have been upzoned or rezoned under her tenure, and we won’t get into that here. But if you compare her qualifications for her job to Tierney’s qualifications for his job, it’s laughable. I mean, he simply doesn’t have any. His only qualification is that he worked in the Koch administration for the City. That’s it. So I think the change of mayors has had a dramatic and negative impact on the work of the commission. It’s particularly disturbing under Bloomberg, because he seems to be someone who is enlightened on so many levels, culturally more sophisticated than Giuliani. Certainly more erudite. Yet he can be, having said all the right things as a candidate, he can be such a two-face on what he’s done to harm the work of the commission. It’s sad. Bromm: I think he’s enthralled with new construction, and that he imagines that all new construction will somehow have a brilliant architect attached to it. Were that but true. It ain’t true. We know that. You know [Daniel L.] Doctoroff, his Deputy Mayor, is very, very keen on construction and redevelopment. Clearly Doctoroff has had some role in influencing some of what Amanda’s done at the Planning Commission, if you look at Atlantic Yards [Pacific Park] in Brooklyn, for example. So, but what’s the whole answer? I don’t know the whole answer. I really don’t. Patty [Patricia] Harris, who is certainly the key Deputy Mayor—many of us remember her from many, many years ago when she worked in the, for the city under Koch. Patty was at the [New York] Art Commission. She, you would think that she would be good counsel to the mayor about appointments to the Landmarks Commission, about various things. But no, it hasn’t happened, so it’s a big question. The other thing that’s odd about it is that Bloomberg, unlike most mayors, elected himself through his own financial wherewithal. I mean he didn’t elect himself, but you know what I mean. Bromm: So he’s not particularly beholden to real estate developers, and certainly should be less beholden to anybody than any mayor in our history. Yet you look around and you say, “What’s going on?” In the ordinary course of politics you would say, “Well. he’s going to run for Governor or he’s going to run for this or he wants to be President,” or who knows what. None of us know the real answer to all that. But again. Q: Let’s see, what else do we have. Did you find problems from political tensions between the city and the state at all as an issue? Bromm: When we worked on Tribeca originally? Bromm: No. You know, [Andrew M.] Cuomo was the Governor. That was before most of us worked with the concept of getting a neighborhood listed on the state and national register, as well as going to the Landmarks Commission for city protection. We didn’t, our group, didn’t really get into that. We started that effort later, but we didn’t get into it heavily at the beginning. But I don’t remember any particular tensions, no. Bromm: I did kind of skip over—you asked me what it was like to be president of HDC. So we got together and started to think about who could follow in his footsteps, which was not an easy job. I think Eric had been the president, I mean it’s a matter of record, but I think he’d been the president for ten or twelve years—a long time. Had really, you know, HDC had just gone to a different level under that. One of the things he did which was really, really helpful was that he would periodically—you know, with the board’s support—have strategic planning sessions. So that HDC could look at itself in the mirror and say, “Well this is what we see, but this is what we’d like to become.” That was a very valuable—I think—exercise. Anyway, we reached out to a bunch of people. Most of them said, “No, I can’t do it.” End of story was I got drafted to be the president, and I said, “I will do it but I’ll only do it for a few years because I want to see us take a new direction, which is that we don’t take somebody of Eric’s caliber and burn them out. It’s not fair.” You know, when you have a non-profit group, there are always people who say they’ll do things, and they don’t deliver. There are other people who don’t talk much, but they do deliver, and Eric was one of those kinds of people. And he was tough to work with, because he demanded things of people. But I think his tenure was just terrific, and very very valuable to the organization. So I tried to bring people back together, and I reformed some of the committees. I started a committee called Admin. The idea of Admin is that people on the executive committee—president, vice president, secretary, treasurer and the executive director—would sit down once a month and have a meeting and talk about big picture issues. But it was a meeting that was open to anyone on the board who wanted to come and sit in. They wouldn’t have a vote, but they could sit in, they could participate, they just couldn’t vote. I also started the idea that we would have a board of advisors as well as a board of directors. I wanted the board of advisors to become a group of people who had wonderful name recognition, but wouldn’t really have to do anything, but we could put their name on our letterhead. We could use their name, we could reach out to them for advice from time to time. They would be helpful because they would give us some name recognition. That was moderately successful, but not completely. We still have the board of advisors. We’ve now got some really great people on it, but we still don’t use them effectively in terms of name recognition, and that kind of thing. So we’re still trying to work on that. But I was very proud of the fact that one of my big goals—that I didn’t want to be president for more than two or three years. After two years I said, “Okay, time for a new president.” Everybody said, “No, no, no. You’re doing a great job.” So I stayed for three, and then we got a new president. I’m very thrilled because David Goldfarb, who followed me, agreed with that concept. He was president for his short tenure, and has stepped down. We now have a new president. I think we’re on the right track, and I think we’re going to keep that up. I think it’s healthy for the organization. We have been successful at expanding our financial footing. We now have a bigger staff. All those sort of good things, but there’s still that tension about are we radical and tough and extreme enough, or are we too mamby-pamby. In other words, are we too militant or not militant enough? I mean, that still goes on, but at least everybody is a little more together now than they had become. Bromm: After so long, yes. One of the disappointments was that a woman you probably know, Vicki Weiner. Vicki had been on our board, and she had been the executive director of Greenwich Village Society for Historic Preservation. One of the sister organizations that’s at the rectory. Vicki had, by the time that Eric was in his final years as chair, she had become our executive director, and I thought she was doing a pretty good job. Not everybody on the board was thrilled with her, some board members really disliked her. I attributed that to a kind of carry-over of the tensions toward the end of Eric’s tenure. Anyway, we had several sessions about working together and yadda yadda, and it’s going to be a little different but I hope you’ll stay on and she said, “Yes I’ll stay on.” Then the minute I became chair, she changed her mind and said, “I’m out of here.” She did it very suddenly, and it was a little awkward because I had barely had my feet on the ground when suddenly we didn’t have an executive director. So we had to start a search for an executive director, and it was at that time that we hired Simeon [Bankoff]. I mean, after a review process. Simeon had worked with Vicki years earlier in the office, and then had gone to the Historic House Trust. Then when he saw our outreach for a new executive director, he applied for the position. It was down to him and two other people. I had put together a group that was the search committee in much the way that Eric had done because I wanted people on the board to feel part of that process. I didn’t think it was appropriate for me as the president to say, “Okay, you come in now. Let’s talk, and okay, you got the job.” I thought that that would be completely inappropriate. There was some tension that Vicki had been hired by Eric that way, so I didn’t want a rerun of that. End of the day, Simeon was the choice. Franny was part of the committee, Tony Wood was part of the committee even though he wasn’t an active board member. I called him in, I don’t remember who else, but we, so there was a consensus to hire Simeon. I think to a large degree because of his enormous enthusiasm and the fact that he is a preservationist. He’s not a bureaucrat, he’s not an administrator. He’s a preservationist who wanted to be an administrator. I think that swayed people, rightly or wrongly. Bromm: Yes, then I stopped being president. I’m still on the board. One of the things that we did from a preservation point of view was that David Goldfarb, who followed me as president—he and I and a couple of others fought very hard against NYU [New York University] on the demolition of the [Edgar Allan] Poe House and on the construction of the new law school building that was going to obscure Judson Memorial Church and the community house alteration behind the church and on and on and on. HDC board decided that we should really become heavily involved in that, and so we did. Yhat was in some ways a successful battle, because we got NYU to back down on several fronts. We kind of shifted the direction that it had been running for years to the point, where I think that GVSHP [Greenwich Village Society for Historical Preservation] has been able to pick up the ball and run with it successfully against NYU continuing to stampede over the village neighborhood, which is very much their turf. I mean, HDC focused on it because it was such a controversy. Bromm: But there was a lot of lousy design on that building. We put on our architectural critic hats and said, “This isn’t very good over here, the way you’ve got the roof going like this.” They would sit, they were kind of stunned, because they thought we were just going to say, “You can’t build this building. You’re going to harm the historic character of the neighborhood.” But we said, “Okay, you’re going to build the building whether we want you to or not. At least make as good as you can make it because it’s not. You haven’t really given NYU a very good architectural project.” They were little surprised by that posture, I think. But I’m glad we did it. Q: And what they built you’re pretty happy with? Bromm: But it’s better than it would have been had we not been involved, so you have to say, “Okay, we did something positive there.” Was it everything we wanted? No, but had we not been involved—and David Goldfarb deserves extraordinary credit for his work, because he was the one who did. His field is law, he’s an attorney, and he took on pro bono representing all the groups including HDC. There was a whole coalition of groups who joined together as plaintiffs to bring suit against NYU to force them to do a better job. His work was terrific—really terrific. His reward for all that was that he became the next president after me of HDC. I think he did a good job during his tenure. So. Bromm: Now I’ve given you a better answer to the HDC question. Q: So how do you think that attitudes have changed about historic districts since you’ve first been involved, or have they changed? Bromm: Oh, they have changed. I think there’s a bigger public recognition of how valuable they are in preserving a sense of place that tells people that they’re in a neighborhood that’s different from some other neighborhood. Brooklyn Heights versus Tribeca versus Greenwich Village versus the Upper West Side. Each of those areas has a sense of place that is palpable and that is created by the architecture. The storefronts, the roof lines, the façades, the window treatments—all of it. I think a lot of people, oddly enough, in the real estate industry are now very savvy about this. All of the brokers who are active in neighborhoods that are popular—i.e., Upper East Side, Upper West Side, SoHo, Tribeca, Brooklyn Heights, you name it—they all know that a building in a historic district is more marketable, and they trumpet that. So they’re well aware of it. I think they play a role in helping to educate the public about those benefits, so that’s good. That’s different—that certainly was not, this of course is my take on it, but I don’t think that was as prevalent in the ‘70s and ‘80s as it is now. If you imagine what it might be in terms of public awareness had we had a continuation of the sort of level of professional commitment that the Landmarks Commission exhibited in the years before Giuliani became mayor. If we’d had that continued, I can’t imagine how much better it would be. I mean, it’s almost painful to imagine it, because we haven’t achieved it. But I think, in spite of the Giuliani years and now the years under Bloomberg that have been backward years. I think in spite of that, we’ve still seen a broader public awareness of preservation’s merits. If you look at how HDC has grown, if you look at how GVSHP has grown, and that’s just one—that’s just Greenwich Village, we’ve still seen some steps forward. So that’s good. Almost miraculous, I suppose. Q: What would you hope for in the next mayor and the next administration? Bromm: Somebody who gets it. It’s not hard to get. If you have a mayor who loves new development, that mayor can also love preservation. The living proof of it are neighborhoods like Williamsburg, Dumbo, Tribeca, SoHo. These are all adaptive use neighborhoods where people never lived and now they do. Look what it’s done to the tax base for New York City. I mean, it’s a no-brainer. If you say, “We have an area that we want to see new development in,” great. Let there be new development, but make sure you’ve protected the historic resources first so that the new development is guided intelligently rather than haphazardly or not at all. It’s not hard to figure out. One of the things you talked about—government tensions between the State of New York and the City of New York, and I responded that we weren’t aware of particular tensions. What I didn’t say, which I ought to throw in, is that we were well aware of tensions between the City Planning Commission and the Landmarks Commission. Here you had two city agencies who barely spoke to each other. We had—there was a woman at the Buildings Department [New York City Department of Buildings] called Lenore Norman, and we would regularly seek her help in getting the two agencies to talk to each other. People would apply for a demo [demolition] permit on a building that was supposed to be flagged in the computer because the commission was going to hold a hearing on it, but nobody told the Building Department or nobody told the Planning Commission. Getting these city agencies to talk to each other became a study in absurdity. It was like a bad movie, and it still is. If you ask any community activist who’s working in any neighborhood with any preservation group—you know, Brooklyn Heights Association, the Dumbo group, the Noho group—ask anybody at HDC, anybody at Landmark West!, you’ll get the same answer: “It’s a nightmare.” You’d think that by now, particularly with a mayor like Bloomberg who’s so business-savvy, he would have figured out a way to get a computer system that allowed all these agencies to communicate effectively, to share databases. I mean, if a dumbbell like me can imagine it working, certainly people who are devoted to this kind of technological sophistication could engineer it and make it happen. Yet we’re—it’s still in the dark ages. That was a real tension, and I think it continues to be. Q: What do you think that the—what do you think is the legacy for Tribeca? Bromm: It’s already become a very popular city neighborhood. Just as Chelsea has now become a very popular city neighborhood, and as Dumbo and Williamsburg have, and as Red Hook is about to. With that growth and popularity one loses not the grittiness that Tribeca is well known for, because that’s based on the cobblestone streets and the architecture and the fact that it isn’t all pretty and pristine and Disney-esque. I—I’d like to think that it will never quite become that far gone. But with that popularity comes a loss of what those of us who were there in the ‘70s treasured, which was that on weekends there was no traffic. It was quiet. Late at night it was quiet. All of the people who worked in those neighborhoods lived somewhere else and they left, so there wasn’t traffic. There wasn’t pedestrian traffic. There wasn’t vehicular traffic. There wasn’t really much economic activity. It made it a kind of marvelous no man’s land that we all loved. I mean, that’s the way it was. We know that—that in any neighborhood that’s not going to stay that way forever, and Tribeca’s certainly an example of that. What’s perplexing about the high-rise towers that now go up is that the developers who build them don’t seem to have any awareness of why people came to the neighborhood in the first place. You say—that could beg the question, well, if they did know why people came, what would they do about it? They’ve got sites that the city has allowed them to build thirty stories high on, so they’re not going to build a six-story warehouse. On the other hand, are they creating the kind of spaces in the new buildings that people will be attracted to who can’t find the sort of loft that they would have like to have had? I don’t know. If they are, I haven’t seen those buildings. Most of them have fairly ordinary looking apartments that could be anywhere in the city. Maybe people will come just to be in Tribeca because they want to be in Tribeca. But it seems to me that if you’re a really savvy developer and you want to play into the legacy that Tribeca seems to be following, you would create new spaces that had very high ceilings, very open floor plans, and some sense of the kind of simplicity that the original lofts spaces offered. Bromm: You mean that involve vacant sites? Q: Yes, vacant sites or whatever. Bromm: So inside a district with a vacant lot? Oh, I think so. I think there’s certainly, there’s room. But the developer has to be interested in it, because the only control if you’re in a district would be for the commission to say, “Your plan, your proposal isn’t very good. Go back to the drawing board.” Whereas what they really might be inferring is, “You ought to hire an architect who’s a little more savvy about creating something within the district, or you ought to maybe seek some advise and counsel from some preservation folks who would give you free advice but valuable advice.” You know, the commission maybe, between the lines, might have done that under Gene Norman or under Laurie Beckelman or under David Todd. They certainly didn’t do it under Jennifer Raab or under Bob Tierney, and I’m leaving out Sherida Paulson in between. I think Sherida was maybe a little bit more willing to think in those terms, but she was working under Giuliani and she was working with the legacy already of what Jennifer had put in place. Which included, among other things, rules that you could never talk to people in the preservation community. That was a bad idea. If you were on the staff of the commission, don’t talk to those people, don’t take their calls. Absurd stuff like that, so. Q: Where do you see preservation going next and where do you think it should go? Bromm: I think preservation right now needs to focus on putting in place a ground plan, a game plan to ensure that the next mayor has both an awareness of the value of historic preservation for the city and an understanding that its part of his job to uphold the Landmarks Law at the commission. Both through his own action and through his appointments to the commission itself and certainly the appointment of the chair. That’s a tough job. Q: Do you think that’s something that’s being tackled right now, or? Bromm: I think the Citizens Emergency Committee to Preserve Preservation, which I’m a small part of, is trying to facilitate that. We have certainly had many people in the preservation community understand the problem because the committee grew out of a kind of town hall meeting in May of 2006 among preservationists to say, hey we’re all not very happy about what’s going on and what’s been going on, and what are we going to do about it? So this committee came out of that. I think there’s a lot of support for it and I think there’s a lot of interest in it. The question is, “Will we be effective?” I think we’ve had some success already, even though we’re dealing with a mayor who isn’t interested. The real goal is we’ve got to look at making sure that the next mayor—whoever that may be—comes into the mayor’s office with the understanding that the Landmarks Law is a real law and it shouldn’t be ignored, and that his job includes upholding it. Q: Yes. Well I think that’s all the questions that I have is they’re anything else you’d like to add, anything we didn’t cover? Bromm: I don’t—probably a few things, but I think we’ve done pretty well. Bromm: It’s been great talking with you. Q: You too. A lot of interesting stuff. Bromm: We had at HDC a young lady who was an intern. During my presidency we launched a project which I didn’t mention, and that was to look at all of the work of the commission over the last ten years or so. Where districts had been under-designated, which we recognized was a chronic situation. The Upper West Side or Harlem or Brooklyn or Sunnyside Queens or you name it. Staten Island. Well, the community group would come forward and say, “Here’s what we think we have as a district,” and the commission would say, “Oh great, here’s what we think you have as a district.” Then we get this, like the four little districts in Tribeca. This on and on and on this has been a repeating kind of chronic situation. The idea was to go back and look at all the district designations and see how far—how much space there was between what a historian like Dolkart or a community group or HDC or whoever said, “Here’s what we see as the district.” Then what the difference between what was and what the commission designated. To look at those things and try to do a review of it. That was a project that we did a lot of work on, and one of the things that came out of it was that Katie did a chronology of all the Tribeca work to identify what the district that was proposed and what we got in terms of designation. She did that for a bunch of communities. I could probably get a copy of what she did, because it might be a valuable part of the archive to have. So another guy in the neighborhood who was an attorney who had been in the neighborhood for a while working with local business people, but was a very smart guy. He had started to do some real estate work with people who were doing loft conversions. I said, “How do we do this?” He said, “Well, you can co-op the building.” So I said great, so we worked together to co-op the building. Of course he had to be paid a big fee for this, but he put together the co-op conversion plan. The Attorney General of the State of New York has to approve such a plan. We got all that done, and then I went to all the people in the building and said, “Okay, you can buy your floor because we’re making the building a co-op.” Well, that they could understand. Having done that project, I became a real estate developer. I went on to do some other projects in Tribeca that were very much on that scale. Because I have done this, we thought, “Well, let’s put that on the letterhead rather than “preservationist’” or “activist” or “designer” or “art dealer” or whatever. Q: Because that’s what people want to hear from. Bromm: Yes, so that’s a little extra info for you. Bromm: Anyway, it’s been great talking with you. Q: You too, thanks so much for sharing.